The Fujifilm Instax Mini 70 strikes the perfect balance of price to features to make it our top overall pick - plus it makes use of the most affordable instant format. Available in six colors, the Mini 70 is among the most compact and lightweight instant cameras on the market, and also among the prettiest (in our opinion). The CR2 batteries it uses can be a little annoying to find, but battery life overall is great. And unlike rechargeable instants, the Mini 70 should still have some juice in it even if left on a shelf for several months. But most importantly, it's really easy to use. Users simply select their shooting mode - normal, macro, selfie, landscape, self timer or high key - and the camera does the rest. And unlike some of its competitors, focus is motor-driven (three positions) and set by the camera when your mode is selected. Exposure is fully automatic, though there is a +2/3rd EV option (that's the high key mode). Overall, the Mini 70 does a good job balancing flash with ambient light thanks to a variable shutter. Of course, for a little more cash, you can drive away in the Instax Mini 90, which adds negative exposure compensation, the ability to disengage the flash in normal mode and a bunch of creative modes. However its higher price and its more complex operation has us feeling you'd be better off spending that extra money on more film for your Mini 70. We prefer the quality and tonality of Instax film to I-type and if you are going to shoot Instax, why not shoot the largest format possible? If you follow that logic, than the Wide 300 is the instant camera for you. 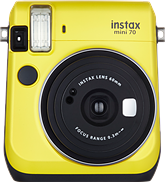 The most affordable Instax Wide camera available, we're big fans of its comfortable grip, automatic operation (with positive and negative exposure compensation modes), motor-driven focus (2 positions) and straightforward operation. Yes, it is enormous, but that's par for the course with this format. Watch our Instant Film Camera Shootout on DPReview TV, or click the links below to read about specific models. I was wondering why there is an omission of any instant cameras using Zink printing papers. Since they are actually digital cameras, you also save files in Jpeg and connect your phone via wifi to print photos directly. I love my Instax 500AF for its auto focus and Instax Wide format. Too bad they are discontinued. There’s an insane market for Instax, I’m surprised at the comments about not getting instant film due to their image quality. Even wedding photographers often include photo booths album using Instax so guests could have a copy right away. If you shoot digital that would take away the fun - seeing the film develop. There were only 2 markets for instant pictures, dating back to the first polaroids. 1- People who NEED an instant print for whatever reason. 2-People taking photos that processing labs either wouldn't handle or would report them to the authorities for taking. With the advent of digital photography, I see no need at all for instant photos. Or send ito them via bluetooth if they have a device equipped for it. Lol, yeah, I'm sure that if you're at a party meeting cool new people you'll be very popular having people take out their phones in the middle of a convo, and configure wireless settings with them for 5 minutes so you can "bluetooth" them photos. "Oh but wait you have android and I have iOS, ok let's try this then..."
Take a polaroid, give it to the person, write your number on the back. I've done this countless times. Not everyone is obsessed by social media and scanning everything, where's the fun in that. The same way that with the advent of digital music, no one needs vinyl anymore, yet vinyl has made a huge comeback. The same way that with the advent of digital readers, no one needs books anymore, but books have made a huge comeback. In this digital age, people are starting to miss having something tangible to hold in their hands, that has always been part of the experience. Some may not realize it but last year, Fuji's Instax line did 7.5 million sales. In comparison, every digital camera (Canon, Nikon, Sony etc..) including DSLRS, mirrorless, point and shoot, only did 18 million. Thats very impressive to say the least and the Instax line is still a massive hit and has been for 20 years now. Instant film gives you ways to be creative that you really can't with digital because no matter how hard you try to cross process or double expose or make your digital photo look like film in post process on a computer, it just doesn't, its too clean and doesn't have the same look or feel. I have greatly enjoyed shooting instant film again and believe it or not, I have more models wanting to book those packages, that also include little photo albums they can give as gifts, more than they want to book my typical studio shoots with digital images. This revival of instant photo is completely mystic for me - such low IQ and focus for high price ( paper) in age of constant struggle for for improvement in digital photography , why ? As much as I'm not a fan of this , but why not just do it with smartphone and print later , and if one desires - downgrade it to look as "instant" (filters widely available ) . I already have several Polaroid cameras and they take pictures that are just fine for instant pictures. However.. the new Impossible Polaroid film looks like crap. I'm sorry. But twenty five bucks for eight pictures (the cartridge itself can hold ten, it did back in the day) and they come out a color shifted blue mess.. it just feels like you're being punched by a hipster every time you press the shutter button on that old '80s OneStep or the SX-70-a truly elegant camera let down by modern emulsions which are a shadow of the ones from when it debuted. Usually, things like film get better as time goes on. Stick with the Fujis, their pictures look much better. The thing that the Lomo Instant Square has going for it is that it's the only multi format camera (shoots both instax mini and square formats). I wish that Fuji's SP3 printer did the same thing, I'd buy it in an instant (pun not intended). Just wait for the Lomo Diana Instant Square coming next month. It has manual controls, a hot shoe and interchangeable lenses. There is a kit with 3 lenses (plus the 75mm kit lens) color filters, flash and some other accessories. That should be fun. Some serious fine art photographers used Polaroid film back in the day. There was an exhibition in the late 70s that included names like David Hockney, William Eggleston, Ansel Adams, and many others whose names elude me now. A beautiful book was published about it. Some worked in larger formats but many did SX-70. The rendering of the films was beautiful and not at all like these examples here. It sounds like the revived Polaroid has some quality-related growing pains, which is a pity; hopefully they get it straightened out. These are way bigger than 4cm x 6cm. On a serious note, I don't recall how common the 4x6in instant was. I remember using 4x5in pull-apart film though. I can't figure out why you want such a tiny print as 4cm x 6cm, but I'm glad these instant prints are bigger than that. I am all for having an instant hard copy. And I think that this is fun in its way. Anyone that is considering this (like me) would do well to check out the pro and cons vs a small zero ink printer (canon ivy). Like @itguy08 have said below. I have zero experience with both. Can anyone share theirs? I am leaning toward canon ivy. IQ is better, I think. Better control and post processing (adding frame and effect). Can create multiple copy (so it is not a unique object anymore, so can be con, but not for me). About 50cen (in US) a copy, so price is ok. But need to wait for 25 sec for the printing to finish. I think it is ok, but instant camera can be faster? Thanks for this post. I had not heard of this printer and am checking it out now - 58 reviews on A to read. It would seem to complement an Instax camera, as it is much smaller and can easily be carried daily with your phone, whereas the cameras are large. The latter still make a statement about you that I think is very positive, but having this little thing around would be a plus, too. Again, thanks for the heads-up. Neither of these are instantaneous so I doubt the slight difference in speed is much of a bother. To your other question, you either want a printer or a camera. Someone who has worked in a photo shop that was located close to a bordello told me they used to sell lots and lots of instant film before there was digital. Obviously many had fun taking pictures. Very few were brave enough to have these shots developed in the lab. Thanks...yet another use for these cameras that I hadn't thought of. "Thanks...yet another use for these cameras that I hadn't thought of." I need to chime in here as I recently bought an SQ6, and I'll explain why. People who tend to judge this format/system by the usual standards such as IQ, print size, etc., miss the point(s). Time to adjust/expand those paradigms. Yes, as pointed out, they are "fun," especially at gatherings, such as family reunions, where the kids have never seen a photo of themselves just whir out of a camera. A couple of years ago in Seattle there was a photo expo - I think that DPr was a sponsor. One of the presentations was given by a couple who arranged trips to Cuba; because of the lack of internet/email available, they started giving all of the group members instant cameras so they could hand out the photos. I realized it was a great idea and I made plans to buy one before my next trip to North Korea, where I had been several times but without a way to share photos or videos. That is just one example of their use. Fuji shareholders should be happy, too, as I have read recently in a couple of places that this is one of their hottest photo products. Sorry, I don't have any links, but probably WSJ, among others. I'll check later. Another example of a use for these is offered by the manual-only Mint 70 TL70. For those of us who have become too dependent on shooting 80 photos machine-gun style to get one good photo after culling the 79 losers, using the Mint would be a refresher course in the basics. With that camera (and the fact that you have to pay for the film, and have to wait for a while before you can shoot again), one has to learn to properly compose, adjust for lighting, etc., to make every shot count. It's like going back to the days (high school?) when we first learned the basics. Some media schools - my university, for example, start out their students with film cameras, as do tow other universities that I used to work with. It must be remembered that these cameras are not meant for probably 99% of the people who visit this site, and certainly not meant to replace our standard cameras, but are there to be brought out when some circumstance arises in which they would be useful and/or entertaining. I know that I'm forgetting a couple of uses which caused me to get one, but I'll add them later. I'm sure others have some ideas as well. I appreciate that (alert - possible flame-attracting comment), some may consider it a kind of statement that you're not locked in by the usual norms and have some flexibility, perhaps even a little more creativity. No problem with that. Great summary. Fuji makes more money from Instax than their entire digital camera business. Well worth the coverage here. And yes, I recall seeing it in the WSJ or Washington Post. Thanks, Davinator. I'm even wondering if Fuji, using the old example of the razor and blades, might some day really lower the prices to almost free, perhaps on some ultra low end model - to increase film sales, which has to be what's really attractive to them about this whole line. Of course, if they become too successful, the competitors will take notice and may not stay on the sidelines...not necessarily bad news for Fuji as the competitors may use the Fuji film standard. I think that this "return" of instant photography is a lot of fun... and I'm impressed that DPr picked up on it and is willing to explore a format that is different than their usual (safe) topics, discussions, etc., and introduce it to some who may find a way to take advantage of it, such as the company taking groups to Cuba mentioned in an earlier post. One final (ha ha...yeah...right). One of the negatives about buying the model I chose (SQ6) is that, as of now, there is no B&W film available. I plan to talk to Fuji about this, but know they can't say anything. That means that folks who want the option of B&W (and a somewhat larger and differently shaped print) can look at the Wide model (or the Minis with the smaller prints), discussed by the DPr review above. It's affordable, and I even thought of buying one but don't really want to carry two of these monsters around. The b&w from the wide is actually pretty decent. I used a fair of Instax for couples at weddings. Here's one example. After a couple dozen Instax shots, the couple can take those with them for the day while I process the remaining film and digital shots. Clients loved it! Thanks; good use of the camera(s). I missed your reply until just now because I failed to see the "Load More Replies" option. Instax has advantages that you say. But one limitation is the worst for me. In group photography you had mentioned. You can not share the printed out picture to everyone in the group. I have several SX-70 photos from the 70's that are cracking/peeling/flaking apart inside the clear covering, and they have been stored in a heated/air conditioned house. They have been scanned now but still look awful. Leica, eh? I did LOL at the Red Dot on an instant camera. Might be worth buying one just as a conversation piece. Nah. I'll wait for the Hasselblad version. I hear that the Hasselblad version is stellar. 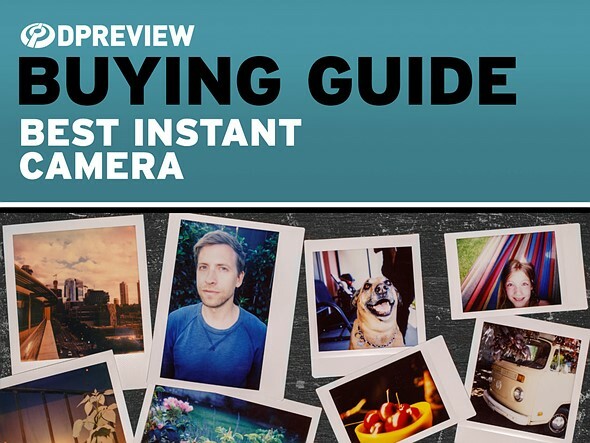 Can you add the specifications of those Instax cameras in your camera database ? it would be nice to compare the sizes. Camerasize has the SQ6; there may be others but I just searched on "Inst"
I really wish Fuji chemical engineers could come up with a cost-effective method for a color transparency INSTAX film. Given how miniaturized and high-quality dye-sublimation technology has become, it would be nice if it could be built on that process; that way you could buy film packs for slides, and film packs for traditional direct positives. Lord knows these INSTAX products have enough demand to warrant the investment. Polaroid used to make an instant 35mm slide film called Polachrome. Here's an interesting blog post about it. Each roll had 12 exposures, and it could be developed in just a couple minutes using a miniature Polaroid film processor. Pre-digital, I used it a few times to shoot events where I needed to deliver slides before the end of the event for a closing ceremony. The film was slow (ISO 40), would usually underexpose, and image quality was terrible. Despite that, people were always amazed when photos taken just minutes earlier lit up the screen. The challenge today is that almost nobody has a slide projector. I suppose one could create a smartphone app that turns the screen white and cranks the brightness to the max, but without a loupe the image would still be pretty small. @Dale, you talk about Samsung Galaxy Beam3 or Sony Experia Touch. But my very old Lenovo 10" Tab 3 could show the "big enough" slides at 1920 pixels resolution .. IF I *have to* display the slides at the end of event, I'll do it professionally. The 1000+ lux LED portable projector is the professional investment. No smartphone could do that to the audience[s]. Even at max brightness, once it's magnified to be projected on the wall, the brightness would fall below 400 ..
My reference to the smartphone was to suggest that one could use the bright white screen of the smartphone to backlight a slide for viewing, albeit without any magnification. Sorry if that wasn't clear.
" I suppose one could create a smartphone app that turns the screen white and cranks the brightness to the max, but without a loupe the image would still be pretty small." Why not a simple way to connect the phone to a TV, to show the photos, or for that matter, phone-made videos? Should be an easy task. I seem to recall an older Olympus digital camera that had a tv cable included with it. I've never seen one of these. Ever. Last instant I saw was a Polaroid camera, you all know the one, and that was probably more than 10 years ago at this point. That portrait on the Lomo'instant Wide surprised me - It's really nice and sharp, yet retains the lo-fi look - I've got the Lomo'instant automat glass as the lens promised decent sharpness (which it does) - Now I see the Wide does a good job too! Hmm, purchasing decision coming up (unless Fuji makes the SP4 wide printer, then I'd be ALL over that lol). The Lomo'Instant Wide can do a good job but it's automatic exposure is depending on the lightning conditions inconsistent and the +/- 1 compensation may not give the desired result. MiNT will release a rangefinder (seperate rangefinder window) Instax Wide camera that can be used in auto mode or complete manual, but it's a very expensive camera. Lens f 5.6 aperture. Curious what the appeal of the pictures made with these cameras is. They all are very soft, look like old 80's pictures with faded colors and whatnot. IMHO really not worth the effort and cost to buy one of these when you can emulate the junky look in many phones, cameras and even in Photoshop. And have a much better picture. A print in your hand. You pass it around. You give it away. It's unique. It's retro. It works with people who do not have phones, e.g. kids. It's not serious photography. But it's fun. A portable photo printer at $100-150 would be a much better investment in that case. You could hand out multiple pictures, multiple effects, etc. Isn't the point (and the appeal) that the picture is a unique object, which cannot be handed out in multiple copies? if you ever use one you will know. I had a few Polaroids along the way. Mediocre in every aspect and cool only in that it was before digital was even thought of. Crummy pictures then too but you tolerated it for instant gratification. You are way too fixated on image quality. You would be surprised how much teens and youngsters don't care a lick about sharpness and dynamic range. It's all about the experience of memory making and bonding. I'm not talking about lack of sharpness and dynamic range. I'm talking about GOD AWFUL quality. Nothing being in focus, colors that look like the faded pics in my parent's albums, and just all around horrible medium. Today's teens and youngsters would be better served by using their phone (which takes awesome pics compared to the instants) and sharing them amongst friends. And they always have their phones with them and can experiment with this processing and many others much more easily. The instant picture is an idea whose time has come and gone. There's a reason Polaroid stopped making the film. It's not because it was great. It's because people realized how bad it was once digital became cheap, good, and easy. uMad... Thanks; I had to look that one up! itguy08, Polaroid instant film is actually back... its film division was bought by a company that tried to revive its film. Instax has been around for like two decades. Fuji makes bank selling Instax stuff. It's likely the thing that's keeping the company alive. Can your phone emulate a physical print all by itself? Some people prefer the camera, others prefer a printed; both are available as instant-print products.